Wondering if you should save or invest your money? For many people the answer is to do a bit of both. How much depends on what the money’s for, and your financial situation. Here are five occasions when investing’s probably the best approach. Before we start though, remember everyone’s situation is different – Moneycube will always give you advice on what’s right for you. If you’ve got time, investing will almost always deliver a higher return than leaving your cash in the bank. That’s why people choose investment funds to save for a house deposit, for their children’s education, or simply to build up their wealth over the long term. Whatever the purpose, if you’re putting money away for more than 3 years, investing is a viable option. If inflation is higher than bank interest, your bank deposits are worth a little less each month. Ireland has been through more than a decade of miniscule interest rates now. 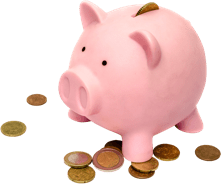 The big advantage of bank savings is that they won’t go down in value – and the government guarantees the first €100,000. But on the other hand, you’ll be waiting a long time to see your bank savings go up in value. Investing should be off the table until you’ve cleared any expensive debt such as credit cards (when not paid off each month), or an overdraft. The gains from investing are not guaranteed. The interest rate on your credit card debt is a certainty. Moneycube always advises our customers to keep an emergency fund. For most people, bank savings are the right place for their emergency stash – though we can help you invest it in a low-risk investment fund if that’s what you prefer. A pension is the ultimate long-term investment: forty years or more. That’s why it makes sense for most people to make some fairly high-risk investments through a pension in the first half of their career. Well-managed pensions will dial down the risk from 10 to 15 years before the target retirement age, preserving the value that’s been built up, and reducing volatility as the time to draw down your pension fund approaches. What’s clear is that in the world of saving and investing, risk and reward are connected. Saving some and investing some is the best approach for many people. If you never take a risk with your money, it’ll never get the chance to seriously grow. In fact, inflation is likely to reduce its value. Play it too safe, and you miss out on the opportunities to really grow your wealth, or at least keep pace with inflation. That might not be so safe after all.